Now that my mind can be clear and focused, I’m turning it at least part way to charity quilts. I’m scheduling another time to give quilts away - this coming Friday, my older daughter’s birthday - February 8. I have about 44 children’s quilts I’d love to give away from my earlier attempts this year to give away almost 160 quilts. I made up a new coupon and on the coupon I said that I had only children’s quilts. Hopefully this will prepare people for the idea that I only have children’s designs left. I’m starting to think now about my next set of 120 charity quilts - what I hope to finish up this year. How? Well, it would be very hard without help. Let me show you what I have so far. These are tops - on the left - that are larger. I will decide for sure whether I want to border them when I get ready to actually start sandwiching. There are over 20 tops there. I have a bunch of tops or partial tops. Why? Well, I have a lady friend in AZ who makes small Around the World designs with the nice American prints and colors. Sometimes she puts 4 of them together and makes a big top for me. For the smaller ones, I add to what she sends me to make a twin size top. I have some more that should be on their way to me soon, as well - as I boxed them up for myself when I was in the states. Due to the uncertain nature of my residency card - I didn’t send them to myself yet. Now I can. I want to figure out some patterns to make pillow panels into quilt tops! These are just gorgeous pillow panels, but I’d rather use them as a center of a quilt than for pillows. More panels that I will use to make up some more fun, quick, but fantastic charity quilts! I also have some panels and such that I can work with to make up some more tops. I want to have a nicer variety next time I give them away. This past time I had almost all the same style - as I had gotten very far behind with Fran’s (my friend in AZ) quilts! I have a whole stack of already nicely cut/torn backings - perfect, ready and waiting for some teen quilts - I say that because one of these backing fabrics is made up of the typical shoes that they use when they go to school - their “school shoes” - similar to what we call Converse sneakers. I also have other backing pieces here - the whole pile has fallen over. I work better, more focused and more encouraged if I have a visible chart or something to keep me encouraged. So, this year I made up this chart. I’m going to print it out and mark off the quilts as I get them ready. Last year this time I had a lot of these quilts already done - but I did nothing but charity quilts for Jan - March. I didn’t want to do that again. Plus, I had a bunch upstairs at the church building and didn’t see the need to do so. I will still try to get 20 done by the end of February, using those tops that are already ready to go - or at least part of them. 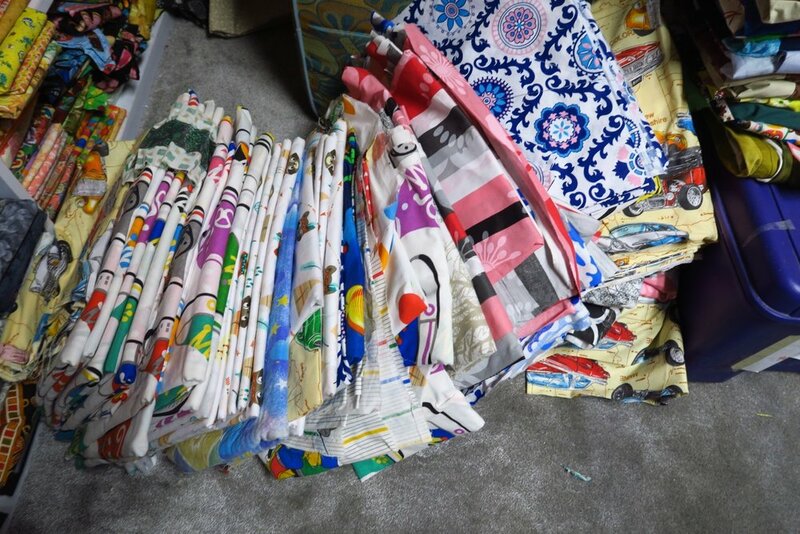 And a problem I’ve gotten myself into is that while I have a lot of tops now and even a lot of backings, as you saw in that pile that fell over, most of them are not actually perfect for an adult sized (the doubles) quilt - meaning the designs are Indians, or a children’s car print, or those big converse style sneakers. I’ve run out of my camo backing and almost out of the elephant/swirly backing - the ones I have left are for the smaller, single size quilt. I have over 20 of the bigger tops ready to finish up. I think I’m going to order some wide backing (it’s not as wide as in the states), but it’s here - and what they sell to be used as duvet covers. I have two places I’ve bought from - Kejt and Kary. Let me show you a couple I’m thinking about. These Polish companies tend to make mostly LARGE prints - so great for a backing - but not so great to cut up unless I want to use large pieces. I’ve ordered from both of these companies before, but I’ve never ordered the wider backing (220 cm) but I think I’m going to do that this year. I really AM feeling wild since I’ve gotten my residency card, huh? This is a screen shot from the company called Kejt - www.kejt.pl I had ordered this print before but they sent me the gray/tan one - this time I want this green one - and if it isn’t in stock, I’ll get something else. We all liked the tan/gray one but I want something different! Of course the problem is that I have to order a whole bolt at a time - and they tend to run about 60 meters long. So, we’ll see. I’ll contact them and find out what the prices are. I think I’d like to try it - that way I won’t piece as many backings for the bigger ones. I’ve used up almost all of the strange, odd shaped and smaller pieces fabrics that I’ve had from donations and such. And it makes it faster. And it makes a really nice two-sided quilt. And now you know…plans are in the works for some more of these charity quilts! I don’t want to get more than 2 months behind, simply because it is hard to get caught back up. I know, I realize the goal is my own..and should something come up that I need to change it, I can and I will.